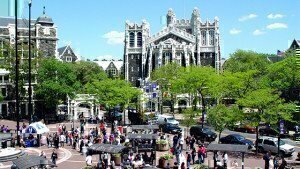 The University of St. Thomas is a Catholic, comprehensive university that fosters a tradition of service to the public and an energetic, thoughtful approach to the challenges of contemporary life. Located in Minnesota’s vibrant Twin Cities area, St. Thomas offers its students a wide range of employment opportunities, cultural events and volunteer activities. The school’s campus is connected to its surrounding community to meet the challenges of the world today. 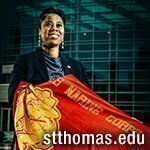 The University of St. Thomas is committed to providing a rich educational experience for veteran students inside and outside of the classroom. St. Thomas has a long tradition of supporting veterans and military families. St. Thomas is proud to continue its long tradition of supporting veterans and military families by offering a welcoming community, veterans association and by participating in the Yellow Ribbon Program. The school is proud that as of Fall 2014, 199 students at St. Thomas received veteran educational benefits. I’m a very proud veteran. I earned my nickname for Julius Caesar. I’m family-oriented, and I love to read books on things like astrophysics and astrobiology. I studied aeronautics as an undergraduate student, and I’ve also been to seminary for a theology degree. There are so many things I want to do! I have so many interests that it’s hard to pick just one or two. I’m considering work as an intellectual property or patent lawyer, but I’m also interested in the video game industry and in art law. I also would consider working as a JAG officer or as a U.S. attorney. After I got out of the marines and finished my undergraduate degrees in aeronautics and theology, I pursued work in aviation and as a corporate security manager. However I always felt as though something was missing and I did not feel fulfilled. My grandmother, Barbra, always told me I should be a lawyer throughout my life. Upon her death, I finally followed her advice and applied for law school. I am so happy I did as feel like I’m pursuing my calling here. Read more of Jules’s story here.